NEW ROCHELLE, New York (WABC) -- A Super Bowl winner from Westchester County was awarded a controversial honor Friday. 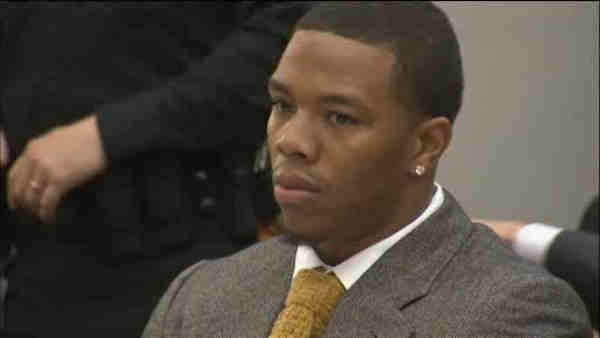 Ray Rice, the former star running back for the Baltimore Ravens who was also standout high school athlete in New Rochelle, was entered into his hometown's Walk of Fame. It's not hard to find big names enshrined along the walk, which includes Jay Leno, Carol and Rob Reiner, Norman Rockwell, Ruby Dee and Ossie Davis. All of them were honored for their accomplishments and their ties to the town. New Rochelle inducted 12 new members Friday, but it was Rice who stole the spotlight. The inductees were chosen by a local committee to be part of this year's class, raising eyebrows after the national controversy cost him his career. "The one thing I never did was apologize to the city of New Rochelle," he said, after thanking his wife and calling her the true hero. "And I hope today is a fitting day to apologize for everything I have put the city of New Rochelle through...I know it took courage and strength to put me on this Walk of Fame, and the decision was not easy. I have only myself to blame for that. I thank you all for judging the man I'm becoming, and not the football player I was." His fall from grace came swiftly after a TMZ video surfaced in 2014 of Rice assaulting his then-fiancee, who is now his wife, in an Atlantic City elevator. "Almost three years ago, I lost a lot of things," he said. "Some friends, some money, family, fame, and most importantly, respect. Respect is the one thing that I chase every day. Why respect? Because respect has nothing to do with stats, touchdowns, Pro Bowls, or even winning the Super Bowl. It has everything to do with living life the right way, and leaving a legacy for my children." His name is now included on a sign alongside six other NFL players, and that sign mentions his domestic violence scandal. "I have taken responsibility from day one for the inexcusable decision I made three years ago, and I've worked every day to be a better man for my family and my community," he said. "I am thankful that I am able to share my experiences and lessons with others to make sure no one makes the decision I did." Reactions from locals were mixed, and organizers said the decision was not made lightly.